Heat the olive oil in a pot. Add the chile ancho, carrots, onion, and potatoes. Brown slightly and add the bay leaf. Add the vegetable broth or water, and take to a boil. Turn down the heat and cook half covered until the vegetables are soft. Season with salt and pepper to taste and add more water or broth if you think it’s necessary. Once it’s ready, use an immersion blender to grind everything. Or, you can separate it and use a regular blender or food processor. You can also wait for everything to cool down before blending it. Pour into bowls and sprinkle the scallions. Serve immediately. 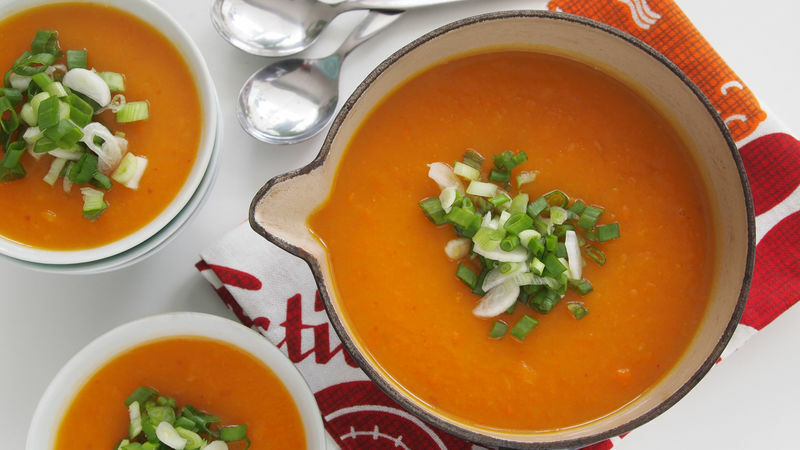 You can skip the potatoes and use only carrots, but the soup will be a bit sweet. Use a pumpkin or other vegetables instead of carrots. If you want, you can add 1/2 cup of Yoplait® natural yogurt before serving.